Hello from England! I’m sitting here in a coffee shop looking out at centuries-old buildings, drinking what might be the only decent latte in all of Oxfordshire, sitting next to a man who looks just like Slavoj Žižek. Lee just marched off in her fancy dress and Harry Potter cape to take a final exam. England’s about a month behind Oregon, so when I left, our lilacs were dried and brown, and the summer heat was starting to show off what it can do. But here, it’s still a little chilly, and there’s asparagus! Asparagus! I’ve become a little obsessed with wild asparagus (blame this picture), and yesterday’s late night wikipedia-ing led me to the information that Germany’s asparagus season goes until June 24th(!) So that’s my excuse for posting a recipe that might be a little out of season for most of you. I’m in Europe! Things are different here! A few notes: Bake this fresh. It was not nearly as good the second day, especially the browned edges which got kind of… gross. Not terrible, but not wedding worthy. And I took the mint out of this recipe, because the first bite was great, but after that it was distracting and kind of unpleasant. Timing: Chopping took me 10-15 minutes (I was multi-tasking, though, so you might be able to cut that down). Cooking the sauce took me 20 minutes, and assembling took me 7 minutes (you could easily do multiple batches of all of this at the same time). Baking took 20 minutes, resting took another 5. – Refrigeration: Like I said, bake it fresh. Once you stick it in the fridge, the texture really suffers. – Sitting around: With my normal disclaimer of please don’t give yourself or your guests food poisoning, this did pretty well on the counter. It sat there for two hours and was still great. It doesn’t need to be hot or even warm, room temperature is great. Equipment: Knives, cutting board, bowls for chopped veggies, saucepan, 4-5 cup baking dish per batch. Preheat the oven to 450 degrees. Boil a pot of water, add asparagus, cook for 2 or so minutes, until it’s tender but still crisp. Drain it and let it cool. Melt butter in a decent-sized saucepan on medium heat. Add the leeks, and cook them for about ten minutes, until they’re soft. Whisk in the flour until the butter-flour mixture is smooth. Add the milk, a small amount at a time, until you’ve added about half of it, at which point you can add larger amounts. Whisking the whole time, bring the mixture to a simmer, then cook it until it’s thickened (about 3-5 minutes). Remove it from the heat. Add the cheddar to the milk-leek mixture, then whisk until the sauce is smooth. Fold in the asparagus (tips reserved), artichoke, peas, chives, parsley, lemon zest, and half of the goat cheese. Transfer it all to a 4-5 cup baking dish. 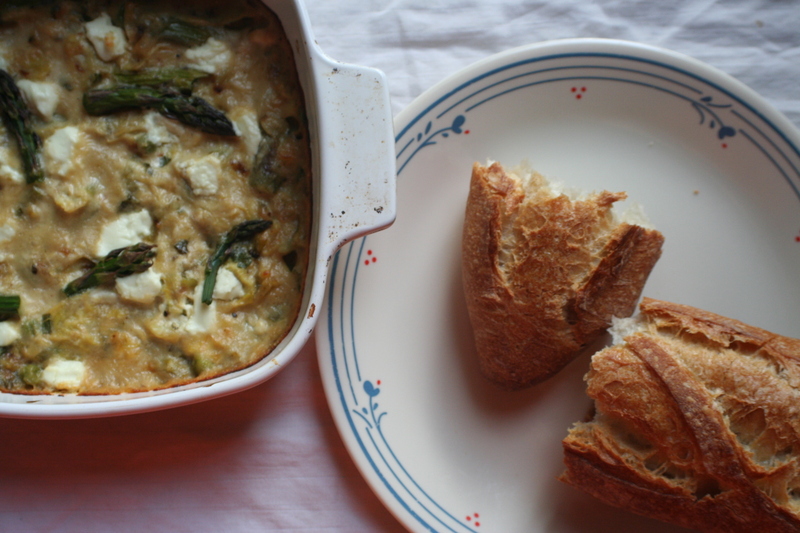 Arrange the asparagus tips and remaining two ounces of goat cheese prettily on top. Bake it for 15-20 minutes, until it’s golden (especially around the edges) and bubbling. Let it rest for at least 5 minutes before serving with slices of baguette.